Author/Illustrator Anna Alter was lined up to be featured this Sunday but later re-scheduled for another Sunday. And when that Sunday didn’t work out for her after all (but after I had already lined up another illustrator for this weekend), I told her that 7-Imp would gladly feature her any ‘ol day of the week. Her illustrations have a way of brightening our days. As a result, I asked my Poetry Friday entry for today to scoot on over — shoo, shoo and skedaddle, I told it, and it obliged me — so that we could feature some art work from Anna’s new illustrated title, Priscilla and the Hollyhocks written by Anne Broyles (but, hey, I snuck in some poetry yesterday anyway). Back in April of last year, Anna graced our site with an interview. 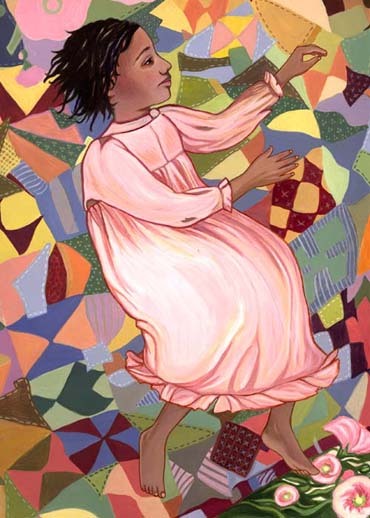 In that Q & A, she shared with us two illustrations from this title, to be published in February by Charlesbridge, and also shared her thoughts on illustrating this poignant tale, based on a true story, about a young African American girl who is sold away from her mother as a slave. 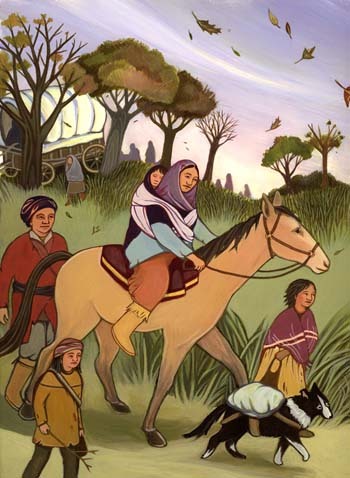 Later, she is sold to a Cherokee Indian and forced to join them on their journey down the Trail of Tears. Eventually purchased by a white man, Illinois innkeeper Basil Silkwood, she is set free — and adopted into his family of fifteen children. 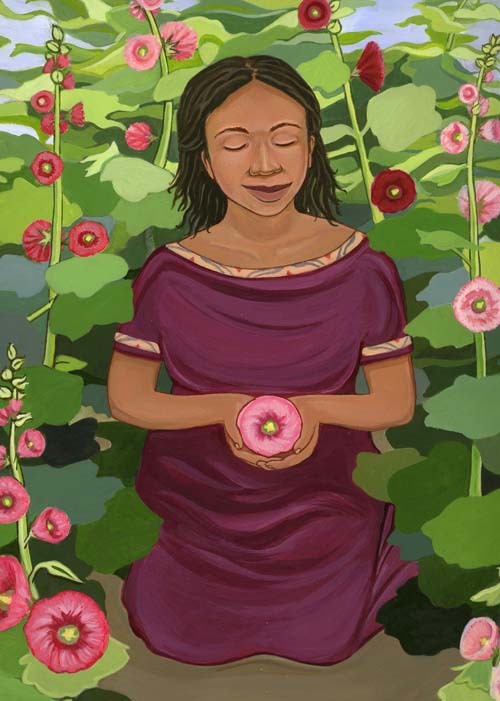 All throughout her experiences, Priscilla carries the seeds of her mother’s favorite flower, the hollyhock. To boot, the book includes instructions for making a hollyhock doll. * Original artwork and sketches/process work on display. Plus snacks and good cheer for all of course! Thanks to Anna for stopping by. Thus ends our Sunday-feature-on-a-Friday. But wait! Anna sent another illustration from the book, and it just so happens to be my favorite one from it, so I’m going to close with a very big version of it so that your eyes can soak it all in. Enjoy! Thanks so much to both of you for the gorgeous pictures! The book looks like a real treasure. Thanks for highlighting the art in Anna’s new book. The illustrations you’ve posted are wonderful! 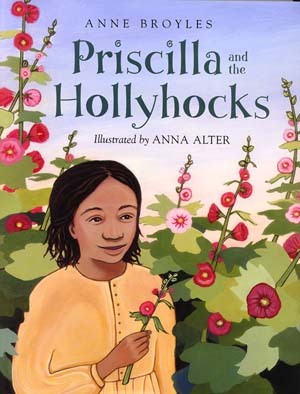 Anna showed me a copy of PRISCILLA AND THE HOLLYHOCKS some time ago–but I haven’t had an opportunity to read it yet. Eisha and I are particularly in love with that last illustration here. Whoa. Whoa. Gorgeous and heartbreaking. The illustrations are JUST so clear. I agree, her illustrations are beautiful. Thanks everyone! I am a big fan of this blog, it is always fun to be featured! I have known Author Anne Broyles for almost 30 years. She is a meticulous researcher and a person who is devoted to writing stories that speak of truth, courage and kindness. I am buying a copy of her book for the childen of the church I attend and copies for my own grand daughters. Congratulations, Anne, on this inspiring book. The last image is my favorite from this batch as well. Thanks for sharing! I publish a ‘zine for girls and wish they could all meet Priscilla by way of Broyles’ exquisite rendering. 1-this week i read Rick Riordan’s fantastic blog entry about his “overnight success” and i almost teared up, remembering back when i was part of the word-of-mouth miracle. and i emailed he back then and he REPLIED! it’s so satisfying to see his success. 2-the picture poetry book by Joyce Sidman, called This Is Just to Say: Poems of Apology and Forgiveness. These kid poet characters could certainly be my real life student poets. 5-Someday This Pain Will Be Useful to You–a great YA, two evenings of savory reading read. 7-goodreads—i’m pretty certain i spend more time reading and writing about books that i spend actually reading ’em. but it’s such good fun. Hi, Amy. I copied (and responded to) your kicks over at the kicks post. Hope that’s okay. Thanks for visiting.